This page describes the routes examined during the Feasibility Study in greater detail. It has been separated from the remainder of the Feasibility Report because otherwise the large numbers of maps and pictures would download very slowly over a low-bandwidth link. 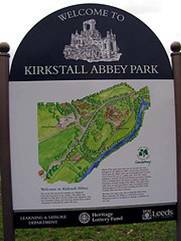 From Kirkstall Forge to Kirkstall Abbey Park. This principal route connects countryside to city following the River Aire. It connects Kirkstall Forge, Kirkstall Abbey Park, to Abbey Mills, Redcote Lane, A65, The Vue, Canal Towpath/Route 66, and Gotts Park. 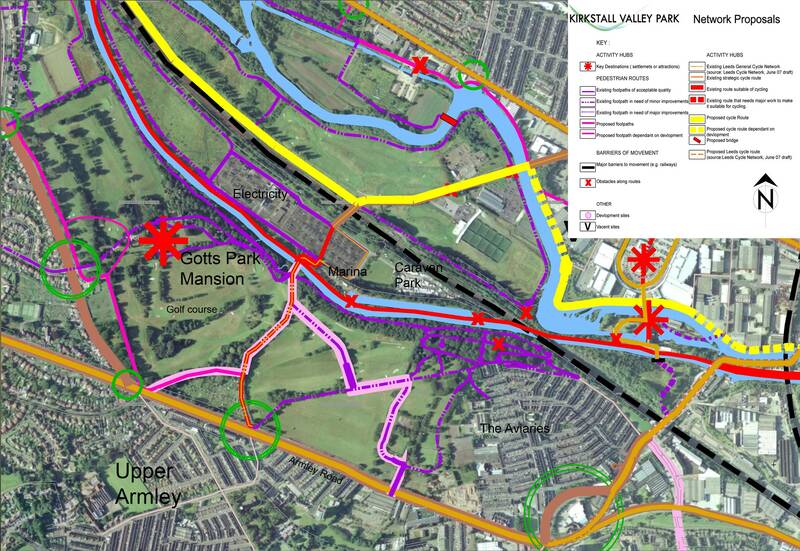 It forms a future route along the River to the city centre, parallel with Kirkstall Road but within a parkland setting. This route is partly dependant on future development although sections can be implemented which would provide immediate benefit. There is an existing narrow foot-worn track that connects Kirkstall Forge to Kirkstall Abbey Park. Along this length the route will require widening and tarmac surfacing to safely accommodate both cyclists and walkers. Character: This section should reflect the naturalistic and parkland setting, and have a soft edge to the River. Detail: Gateway connection needed at Kirkstall Road. Surfacing and sign posting needed to signal the way. Environmental Management: thinning and clearing of overgrown vegetation is necessary to create gaps to enable surveillance. Incidental tree planting to frame views and give emphasis to gateways. 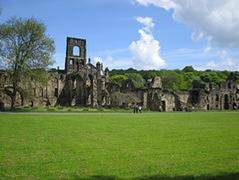 Kirkstall Abbey Park is a dramatic and beautiful destination. The Abbey ruins lie in an area of parkland, which forms a pastoral green setting. The lower areas of the parkland are lined with majestic trees, there are great views of the River here, and seating has recently been provided. A wide track connects the parkland to Kirkstall Road and other paths allow exploration of the abbey buildings. There is a new visitor centre with facilities and car park. An existing central track running through the park would become the new connecting cycle/ pedestrian link along the river. 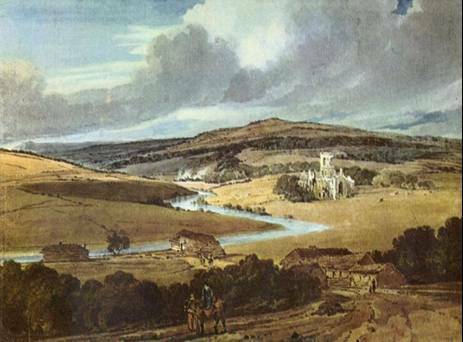 Kirkstall Abbey is inaccessible at present from the south of the River Aire in this location. 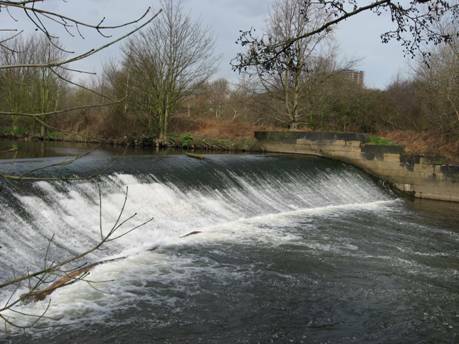 A new footbridge would connect and give access and amenity to the playing fields and the southern bank of the Aire facilitating spectacular views of the Abbey and access to the river. Character. Minimal intervention. Make good any damage around the new bridge to harmonise with the existing. 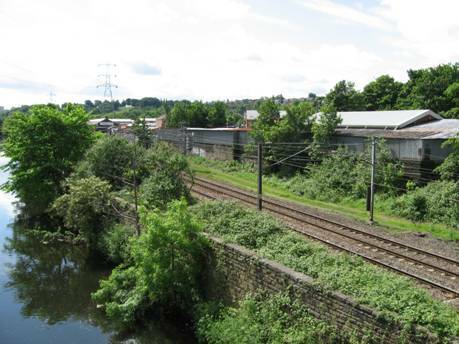 Widen paths to 3m minimum as they leave the park and move towards the wooden footbridge Kirkstall Bridge, and connect to the BHS site and Kirkstall Road. Detail: The surfacing to be tarmac to match existing. Additional signposting will be needed to identify the route along to the Forge, and back to Bridge Road. Cycle / Pedestrian subtle demarcation line may be needed to be identified on the existing central wide track. Environmental management: Cyclists dismount on event and special calendar days and peak times. A Potential alternative route out of the park would be for the route to travel along through the flat ground presently occupied by the Abbey Light Railway. The railway is a popular attraction, supported by volunteers, well loved by children and families; it is especially popular on summer and event days. 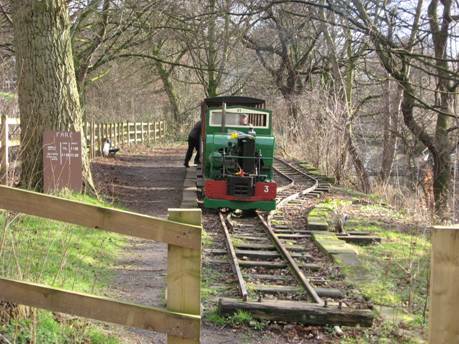 The current route crosses an existing wooden footbridge at the eastern end of Kirkstall Abbey Park and then follows an established route that runs parallel to the Abbey Light Railway. This is a delightful pedestrian walk, it is tree lined with grassy glades filled with meadow flowers and rich in wildlife. Here changes would be minimal, only to widen paths at the bridge junction, repair damage to the bridge (missing uprights), and provide additional signposting to the Forge in the West and connections to the East. A new opportunity arises at the footbridge to connect the Riverside Way from Kirkstall Abbey Park to the new development at the BHS/Alders development site and Bridge Road. This would help activate the development and connect it to local attractions. To achieve this a small level crossing would need to be installed, as the path would cross the light railway track. (Currently the railway runs on Sundays and bank holidays). 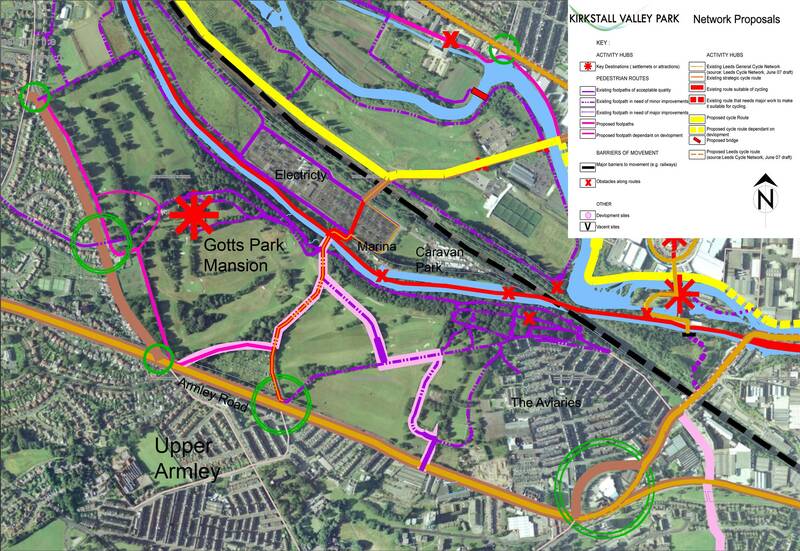 The proposed route runs through the BHS development site to Bridge Road, and makes a new bridge link to the playing fields in the floodplain to the south of Kirkstall Abbey Park. This connection creates a great movement loop, increasing amenity and connectivity. It runs through the Abbey grounds, along the riverside south of the river Aire, and into the BHS site and Bridge Road. Here it connects with existing bus routes. Character: The route through the BHS site will be 4m wide, carry both pedestrians and cyclists, and be surfaced in materials complementary to the quality of the development. 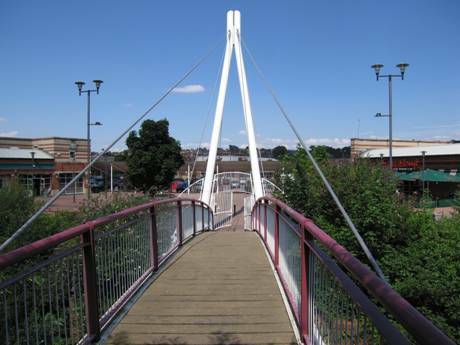 The new footbridge should be small and discrete, can be timber or steel. Detail: New signage at all cycling and pedestrian junctions to provide directions and identify destinations. Environmental Management: Trees and vegetation on the margins of the BHS site provide a good habitat for wildlife, and a rich green resource. These should be managed to promote wildlife and create good visibility. The BHS development site can add further greening, particularly on the route and on Bridge Road, and signify its location in the heart of the park. Bridge Road is a key location, the current status with its new road alignments; heavy transport engineering and the Morrison’s development have eroded the green valley and village quality of Bridge Road. The road has become pedestrian and cycle unfriendly with isolated indirect crossings, narrow pavements and wide splays. 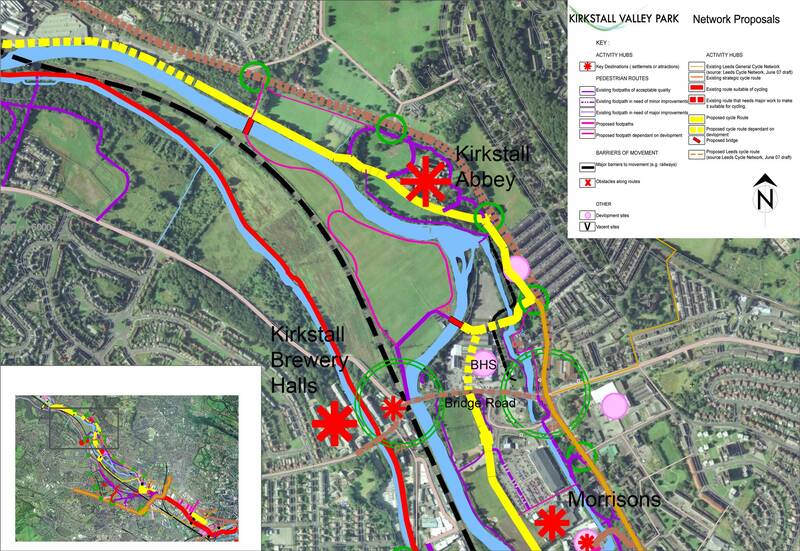 Yet, the road is a movement hub, it connects Kirkstall Village to its environs, it is the confluence of many routes. 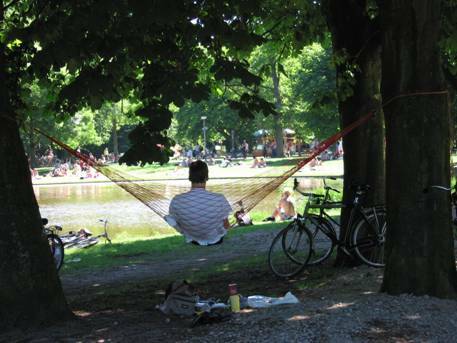 Character: The proposals seek to restore and create a green park like character. All development here, including the road, should profit from the proposed ‘In the Park’ Image, and be sensitive to the proximity to the Abbey and the River. Detail: The road should be tree lined, with wide generous pavements, special lighting, and high quality materials: stone, and a singlewide pedestrian crossing. 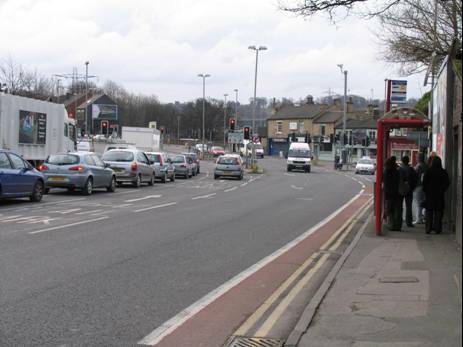 At the junction with Kirkstall Road, engineering should seek to redress the current vehicular priority, which has created pedestrian refuges that are now akin to islands in a sea of traffic. Environmental Management. Traffic on Bridge road should be changed to 20mph, to calm traffic, and provide a new wide pedestrian crossing, to present pedestrians with a more altogether attractive and functional environment. To create a safe, direct connecting route the new primary route should start at the new wide crossing, next to bus stops, on Bridge Road. It flows up to and along the southern boundary of Morrison’s Car Park and links to the rugby Club and the historic site of St Ann’s Mills. At St Ann’s Mills access for both cycling and walkers along the Goit side is limited, due to topography. Near St Ann’s Mills a new bridge is required to connect to the existing track at the nature reserve and the southern side of the River Aire. The Nature reserve, a large tract of land has no links at its western and northern boundary. Here, dangerous attempts are made to get to Bridge Road, (evidenced by tracks), alongside the railway line. The route picks up on the wonderfully attractive views back across the river, before joining the existing track to Redcote Lane. Character: Between Bridge Road and Morrison’s, the 3m minimum wide track should be block paving to match existing blocks. 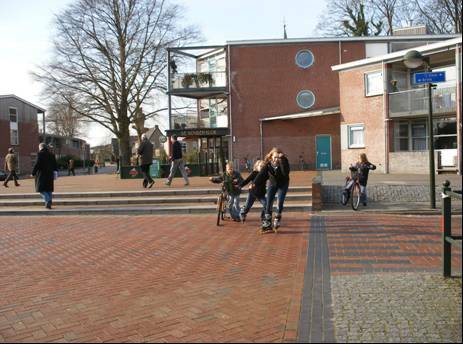 The shared cycle and pedestrian track should be demarcated. At St Ann’s Mills the 3m track will activate and connect this historic area, and should be sensitively handled in respect of flooding, and it’s proximity to the Mills. The sale of St Anns Mills and its subsequent conversion should provide natural surveillance to the route and some car parking for park users should be incorporated. The proposed bridge can be an interesting steel structure to give identity to this crossing, and be respectful to the industrial location. The existing track from the bridge should be widened to 4m and surfaced with tarmac, and orientated to make the most of great views. Detail: Signage and signposting of routes and destinations is needed. Carefully accommodate the levels around the access to the bridge. 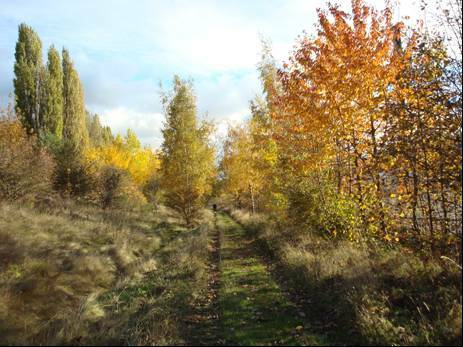 Environmental Management: Trees, shrubs and grasses should be managed to keep the track open, attractive and visible. Opportunities should be taken to increase biodiversity when restoring disturbed ground, wild flower mixes and native plantings should be incorporated to enhance earthworks. 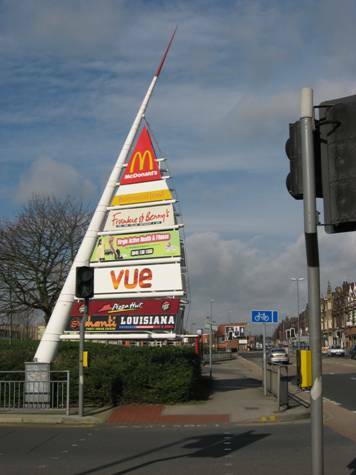 Redcote Lane is a valuable existing link to Gotts Park and Armley in the south and Kirkstall Road and it’s local shops. It has a number of sporting businesses that are accessed from it and assocaited car parks. Environmental Improvements are needed at Redcote Lane to enhance it’s image, make it a safer, more attractive and cycle/pedestrian friendly route. Character: The blend of nature, business and water, generates a unique opportunity to express clean modern design in a green setting. Renovation and distinctive painting of the existing bridge. Resurfacing of the track with cycle/pedestrian demarcation. Environmental Management: Clearance of existing vegetation, removal of inappropriate signage and derelict items. Organisation of bin storage. Coordination of business interests to manage change at the entrances onto Redcote Lane and arrangements to utilise car parking at certain times. This existing priceless route, which connects Redcote Lane to Gotts Mansion and the people of Armley to Kirkstall, to the city and the countryside requires environmental improvements. 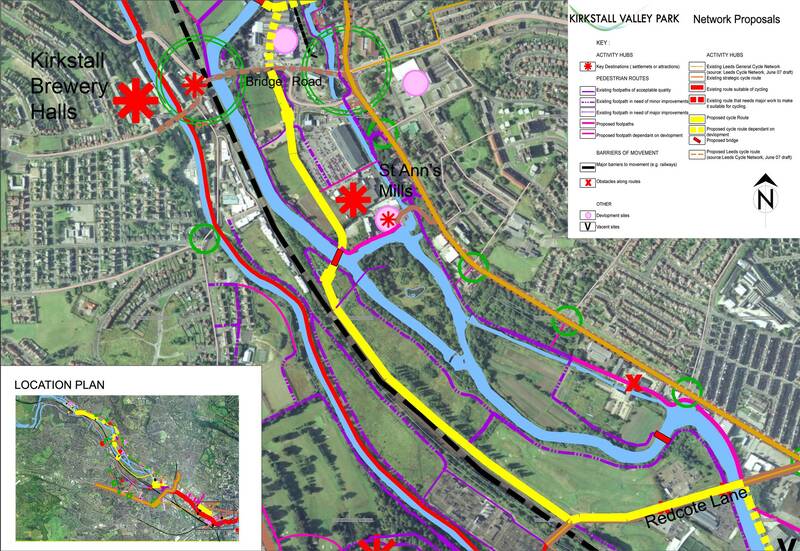 A new direct link can be made over the redundant area of the switching station, providing a clearly integrated new visual and physical link of the route beyond, and the canal side. New surfacing to and around the landings of the bridge over the canal, and to link with canal side paths on the Armley side. The existing bridge over the canal is a pivotal to the movement in this area, and is a place where clear signage is needed. The route up through the park is steeply inclined, needs surfacing and stabilising. An alternative track for the less able is possible. There needs to be a good connecting route to the Mansion and associated car park and to Armley Park. Character: The route that crosses the switching station can be modern and clean in character, and can be tarmac with potential for artwork to express the former industrial use. The route into Gotts Park needs to be designed to prevent rapid run off of water, which would erode the path, and flood the lower areas. 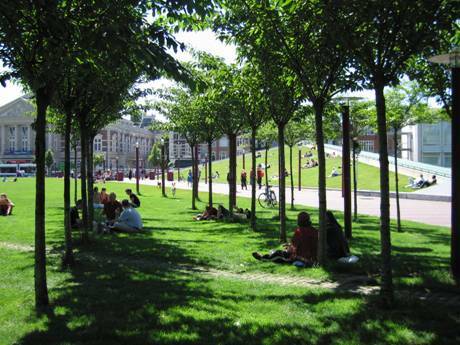 The path needs to be integrated into the slope, and have a soft edge of grass and trees and shrubs. A good connecting route to Gotts mansion is required. It could relate to Repton’s original design for the park. Detail: signage is needed at the canal bridge, within Gotts Park, and at the Gotts and Armley Park entrances, to show routes and destinations. Entrances should be enhanced and clearly identified. Environmental Management: Clearance of trees and shrubs to enhance views, and create good natural surveillance, whilst maintaining adequate cover to stabilise slopes. Liaison with N Power to enable the crossing at the switching station. There are new cycle lanes identified on the Kirkstall Road, however this is a busy and intimidating fast moving road. A new off road route is desirable. A new path section is necessary to connect Redcote Lane to the existing riverside path behind the Virgin fitness club, and Armley Mills visitor attraction. The aim would be to eventually connect a new route along the riverside into the city centre from here, as redevelopment proceeds along the north shore of the riverside. Character: From Redcote Lane to Virgin: A 3m minimum wide tarmac surface with a railing to the canalised edge to this section. From Virgin: Widen the route to 3m and surface the path with tarmac, allow a wide soft edge to the riverside and a post and rail fence as at Virgin. Pathway improvements around the Mill area should accommodate both cyclists and walkers. Detail: Clear and attractive signage for routes and destinations. Soft edge to the river. 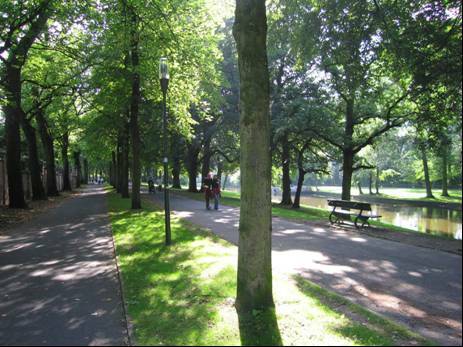 Environmental Management: Manage the soft edge and trees to the riverside to enhance views, and keep the pathway clear. Keep the gates from Armley Mills to the towpath opened. This connection is dependant on re-development. This area is already changing, and new development should make the most of the riverside, as would cyclists and pedestrians with a riverside route. It also connects an existing footbridge to Canal Road. Character: The route will need to be 3m minimum, a wider space 5m minimum, will be necessary where adjacent to new development. The new development must respect good urban design principals; have active edges and ground floor to provide natural surveillance and safety. Design should exploit the riverside location rather than turn it’s back upon it. 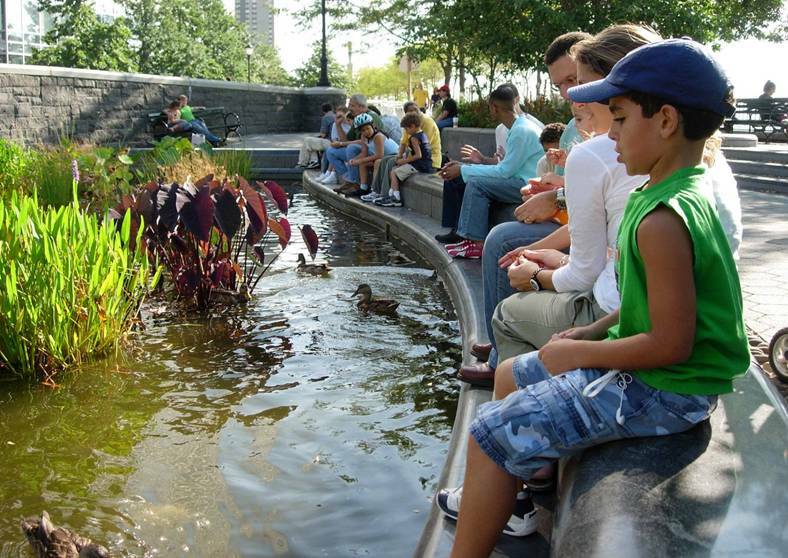 Pocket parks should be incorporated at key locations. Detail: Lighting needed under bridges/viaducts. Clear signage is needed for routes and destinations. Materials need to be selected to reflect the new modern sustainable development. Environmental Management: Liaison with developers will be needed to create a well designed joined up cycle and pedestrian route. Trees and shrubs to be managed to keep paths clear and frame views. 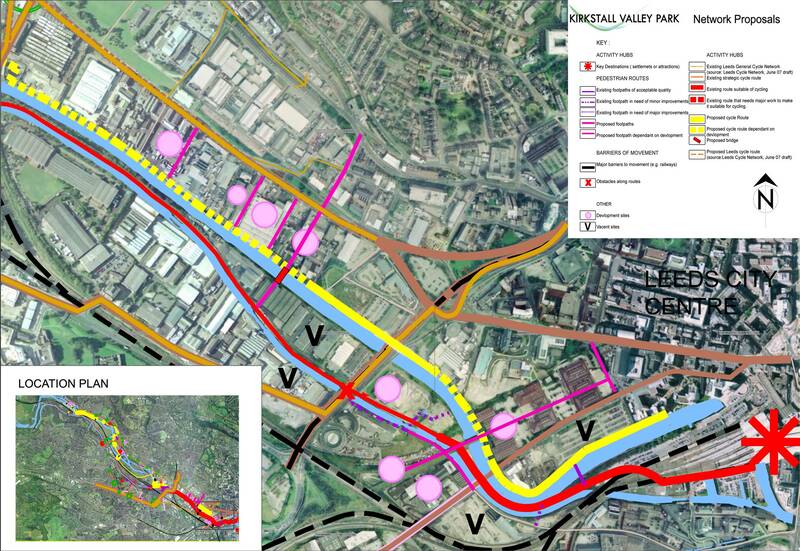 The aim is to create a continuous riverside route from the viaduct to the city centre. This would create a direct route, and would have striking views of the city and local environs. The route is dependent on development, which has already started adjacent to this stretch of the river. Connect Canal Road to the Riverside Way to accommodate ground level changes. 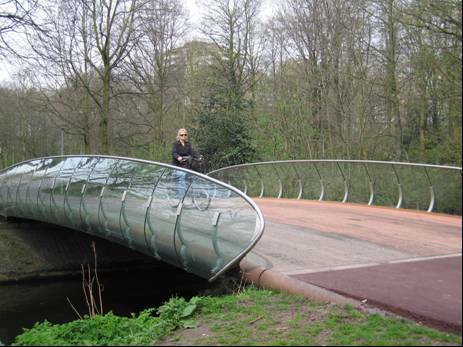 Create a continuous riverside route to accommodate both cyclists and pedestrians. Path to vary in width (3m-5m) with pocket parks and widening to accommodate viewing points and places for anglers. 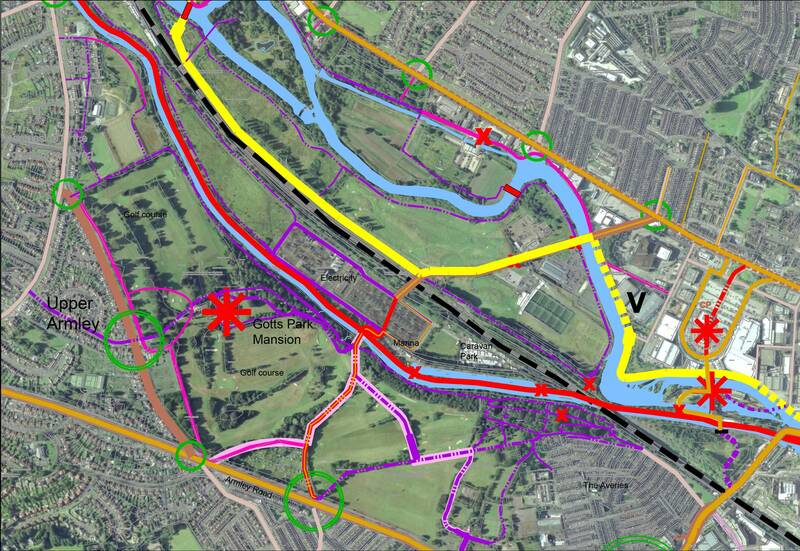 The riverside route is to be connected in various locations to Kirkstall Road to improve use, permeability and safety. Connections to new proposed bridging points identified by developers. 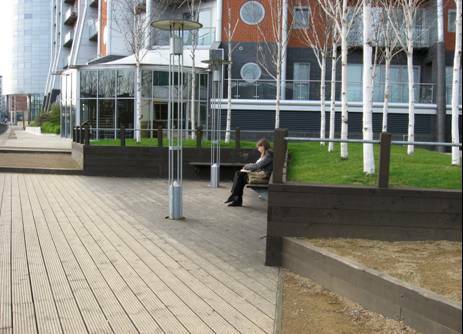 Character: To reflect the riverside developments, the surfacing to be of high quality, durable materials e.g. Stone slabs and setts.New development to follow good sustainable urban design principles: active edges exploit the riverside location, and create natural surveillance. Detail: Lighting required along route connections from Kirkstall Road to the riverside path. Lighting needed on, under and around bridges. Signage is required to identify routes and destinations. Environmental Management: Liaison with developers needed to benefit from joined up thinking and coordinated design e.g. shared car parks for business and park users. 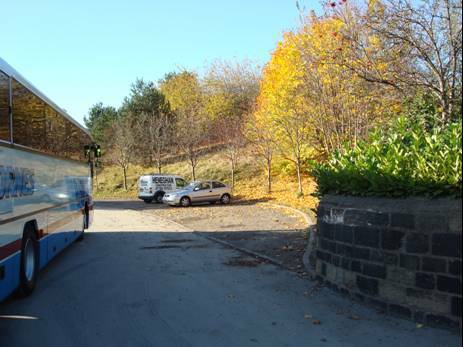 This is an existing, generally flat route connecting the city centre with Kirkstall, Horsforth, Rodley and Saltaire. 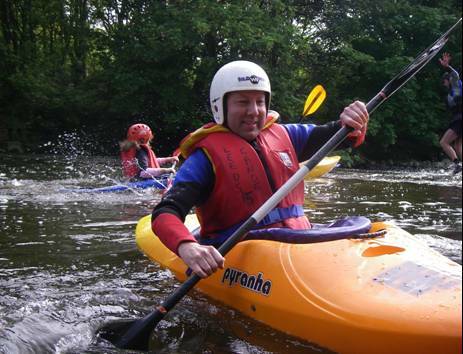 There have been improvements to the towpath in places particularly around Armley Mills and Kirkstall Bridge. The route is well used, especially at weekends. 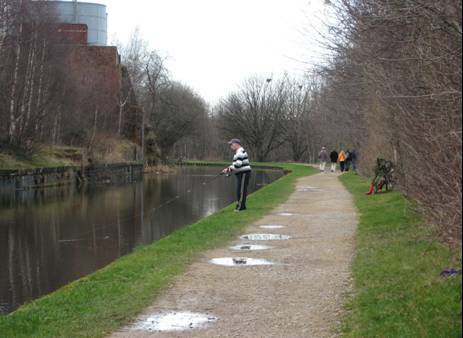 Shared use by walkers, cyclists and anglers creates conflict in places due to the narrow width of the towpath, and the lack of route options. The towpath should be widened where space permits, and existing viewing areas restored and improved. Adjacent tracks and connections, which decongest the route should be utilised. Better links are required because the route is linear, and poorly connected to destinations and amenities. Existing signage is largely for canal users, showing links to Liverpool and should be augmented by local signage. Trees, shrubby and grassy vegetation require management to enhance the environment. Graffiti removal and rubbish clearing is necessary. 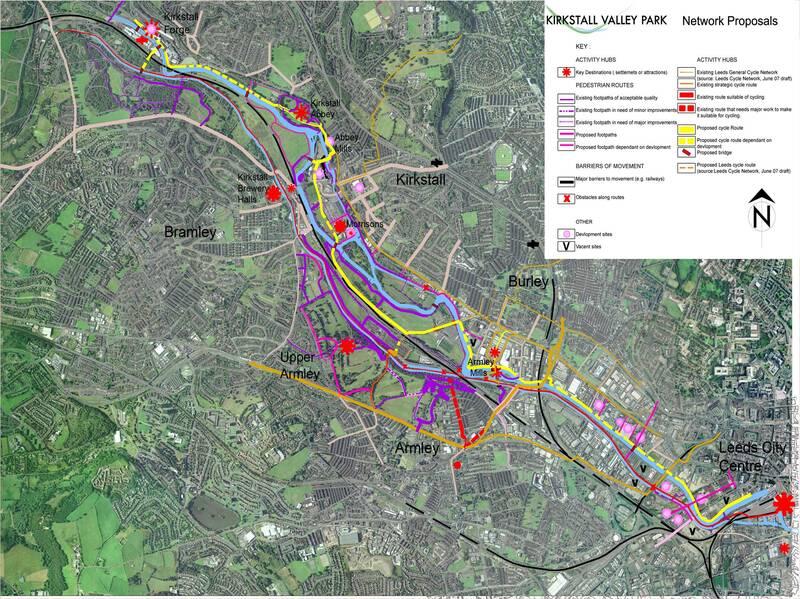 Opportunities to connect the towpath to its surrounding area. It should be surfaced in durable materials e.g. tarmac. Separate and direct cyclists and walkers by utilising the track for cyclists. The track runs up to and around the switching station from Broad Lane. 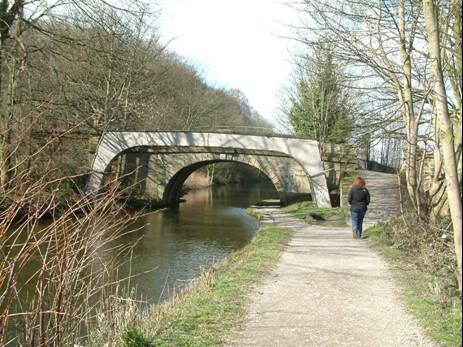 Carefully manage vegetation to enhance the track and its separation from the towpath. 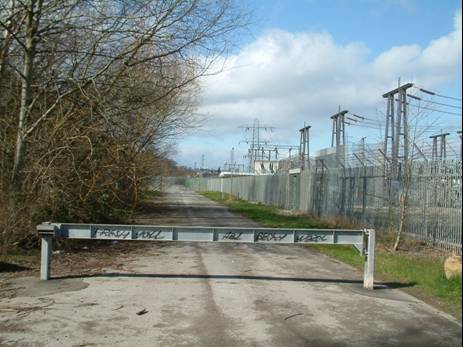 Create a discrete direct exit form the towpath to Broad Lane and car parks at the forge site. Improvements to stepped ramps to allow wheeled vehicles to be pushed up across them. 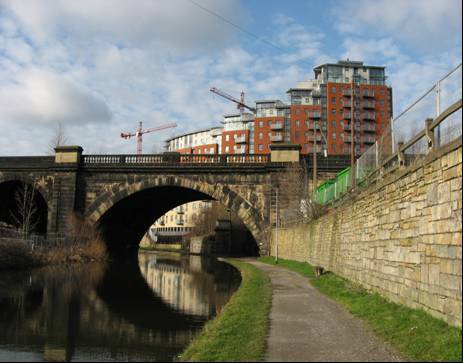 Repairs needed to stone flagged areas around Armley Mills and clearance of Grafitti and repairs to lookout areas. Character: The area around the Armley Mills should be carefully managed; paving to be stone, with sett trims, and plantings reveal spectacular views. 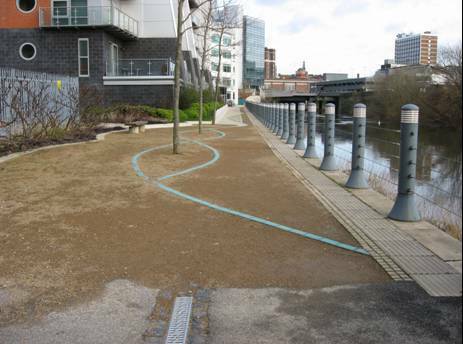 The remainder of the path is to be surfaced using tarmac, with a soft grassy edge to the canal, except at landing stages. Vegetation to be naturalistic or native to enhance countryside character and create biodiversity. Grass seed to incorporate some wild flower species. Detail: Interpretive and directional signage required. Repair losses to paving. The towpath forms a continuous narrow route along the canal side, and connects to the city centre. It possesses striking views of the City and local historic features e.g. Botany Bay. The path is isolated and not well connected to its environs, and it feels unsafe, particularly under bridges, when not in peak use. The towpath should be upgraded where possible, through widening and improved surfacing. It should be connected to new routes that arise as development takes place with shared car parks incorporated. Character: To reflect that of the adjacent new developments, Stone slabs, setts and seating around the lock. Detail: Signage of routes and destinations at bridging/ entry points and in particular at the gateway to Holbeck Urban Village, the City Centre and the Railway Station. The path should be lit around and under bridges and along routes through development. Environmental Management: Planting to be managed to reveal views, enhance biodiversity. Remove grafitti. The A65 is a direct link from Kirkstall to the City Centre. However the road is very busy transport route carrying heavy goods vehicles and large volumes of traffic. It is a noisy, dusty and intimidating highway for both pedestrians and cyclists. Recently proposed improvements to the A65 are aimed at incorporating a quality bus route, cycle lanes and more pedestrian crossing points. However the heavy use of the road means that the pedestrian and cycling experience will only be marginally improved, and further improvements would be desirable, including opportunities to cycle off road. Recent changes to the road layout at Kirkstall Junction have given priority to vehicles at this particularly busy junction. Significant improvements still need to be made to enhance pedestrian use. These include widening of pavements particularly at crossing points and bus stops. Links to car parks at Morrisons and St Annes Mills should be incorporated. 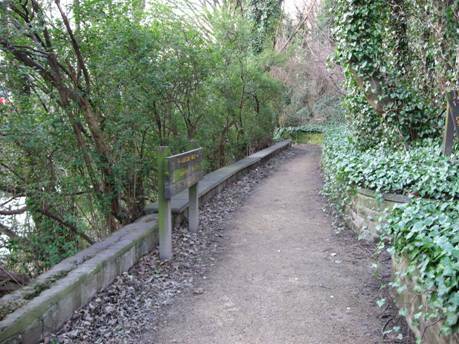 The Goitside walks provide an interesting footpath on the north side of the park and parallel to the Kirkstall Road. 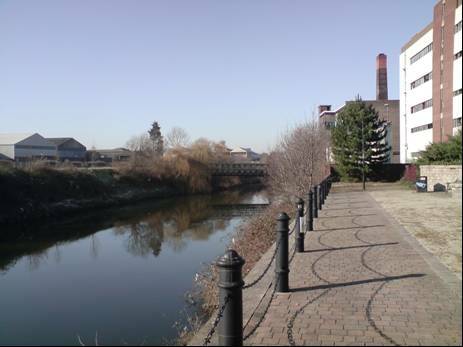 They connect a number of interesting historical features; mills, and millrace, and potentially provide an alternative route to Morrison’s and the wider park. At present their condition is variable, with uneven terrain, poor surfacing and the edges are encroached by over grown trees and shrubs. The area feels unsafe, as it’s poorly connected, overgrown and there is little natural surveillance. 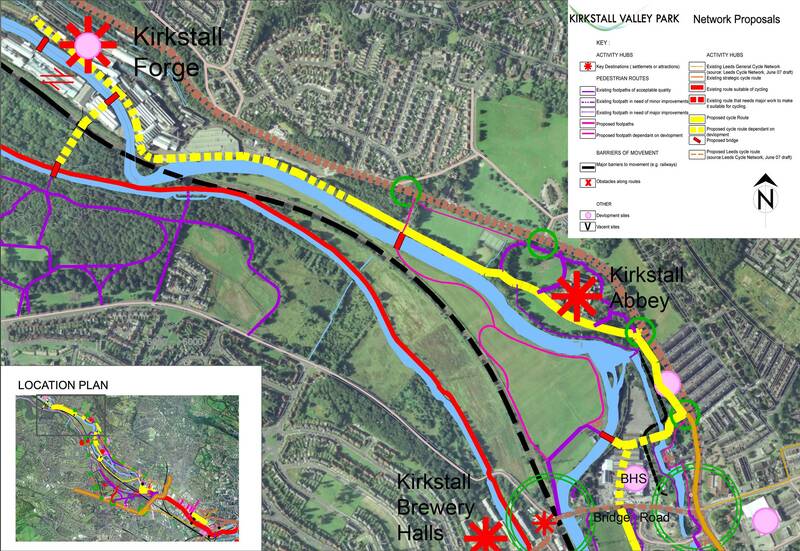 Improvements from the Kirkstall Centre include the need for: better access, surfacing and signage, management of vegetation to open up views and allow paths to be overlooked from the road and St Ann’s Mills, and other development. 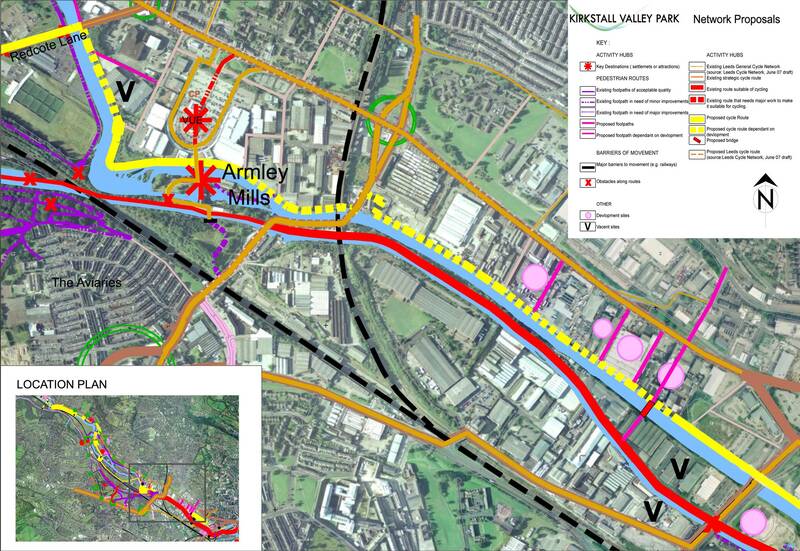 Improve access points From Kirkstall Road, the key link to St Ann’s Mills and the Riverside. Establish new link adjacent to the home office buildings and farm area, connecting by the former site of Gotts Suspension Bridge. 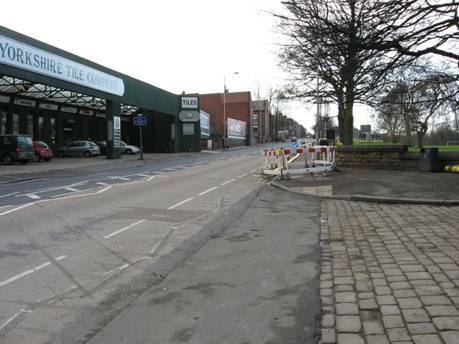 Restore/ replace the suspension bridge link to give access to Redcote Lane and A65 and local shopping area. Character: The Goitside character should be retained as a sheltered small scale park with glimpses to the broader landscape and screening to the A65. Detail: Improvements to surfacing and signage are required. Environmental Management: Planting to be managed to enhance views and increase bio diversity. The movement network aims to connect the communities of Armley, Upper Armley and Bramley to each other through Park and to the City and Countryside. 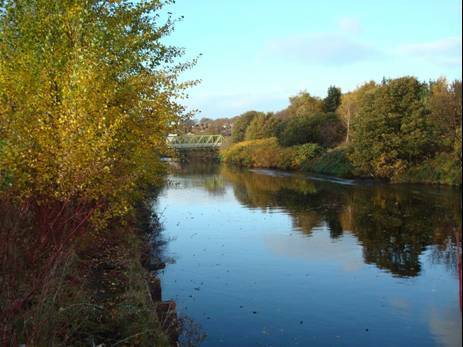 It also aims to connect these communities to Kirkstall, Burley and the extensive green resources of Gotts Park, Armley Park, the nature reserve and Kirkstall Abbey and Forge. These narrow and curving busy roads with narrow paths link Armley and Bramley to Kirkstall Bridge. They discourage pedestrians and cyclists because they compete with vehicular traffic. People are unaware in this location of the proximity of Route 66 the towpath, The River Aire and Kirkstall Abbey Park. Character: Paths should be widened wherever possible, traffic speed reduced on Broad Lane Bridge and Amen Corner to 20MPH. 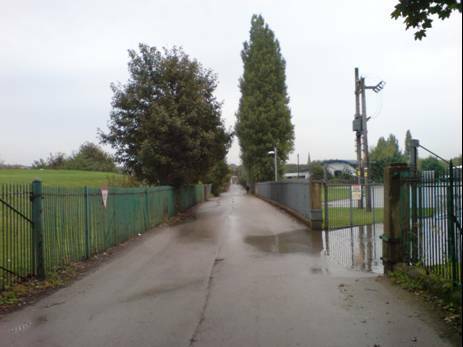 A new park entrance is needed on Wither Lane, to connect to Route 66 the towpath, and connect to the newly designated cycle path track, which leads to the switching station at Redcote Lane. Detail:Simple signage, creating a minimum of clutter, is needed to direct cyclists and pedestrians to routes and destinations. Environmental Management: Establish stronger links between park and highway management and increase number of trees for greater impact. Armley Ridge and Stanningley Road border the SW edge of Gotts Park, where traffic moves at 30/40mph. The road like Stanningley Road separates the Park from the residential area. The public footpath alongside the park is in very poor condition, and access on to the park is restricted due to golfing activity, and un-surfaced tracks in the Park, which get muddy in wet weather. At present car parks in Armley and Gotts Park are poorly linked to paths. Character: Improvements should include; better crossings, marked entrances for pedestrians and cyclists, cycle path markings, improve surfacing and surfacing to public footpath and park routes. Detail: Clear signage is needed to direct users to the spaces and places around the movement network. Environmental Management: Establish stronger links between park and highway management and increase number of trees to enhance the road corridor. The concept is to connect people at a local level to their local spaces and the network, which can take them to destinations further a field. In Armley the two parks are already used by local people and visitors, but could fulfil their potential if there was: better signposting, clear pathways on reasonable gradients connecting to destinations e.g. 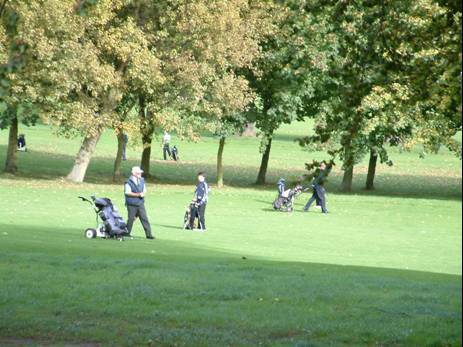 Gotts Mansion, and in places surface paths where there is no surface at all.In Gotts Park itself, the presence of golf is inhibiting pedestrian use. Paths have been driven to the margins, are unsurfaced, unsafe and disconnected. 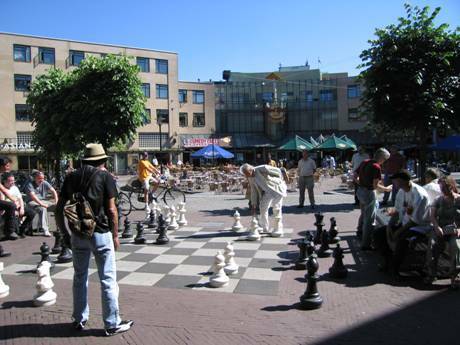 A vision is required whereby the activities can successfully co-exist e.g shared car parks. 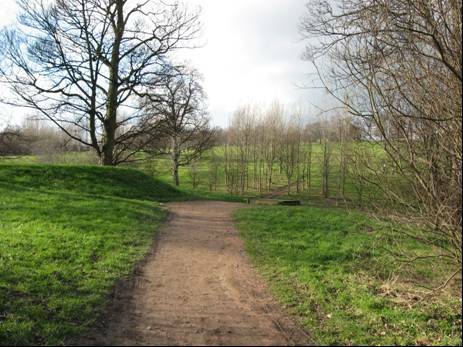 Pathways are needed, these could invite the local populations to enjoy walking through the park and visit the Mansion, a local destination for users from Bramley, Burley and Kirkstall. This is an important connecting road and gateway location. The road links Armley to Kirkstall Road, via Canal Road, along a winding course, over a very steep gradient. To encourage pedestrian and cycle movement environmental improvements should include: path widths and widths of pedestrian refuges should be increased where possible, and road speed dropped to 20MPH. 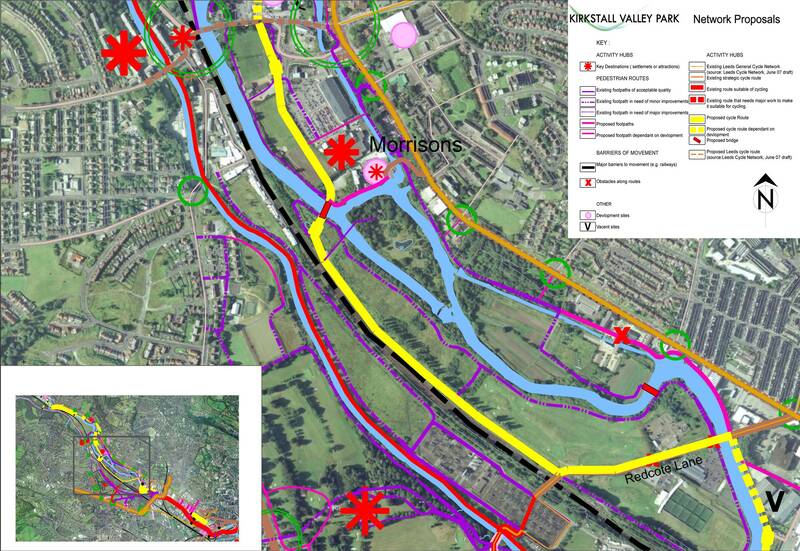 Link pedestrian and cycle routes to neighbourhood Pocket Parks and car parks. At Botany Bay, an entrance and a pocket park with seating should be formed to celebrate the historic area and access to the canal towpath. 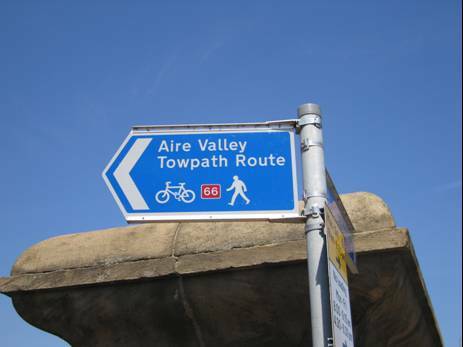 Detail: Use signage to direct and inform people of routes and destinations such as Armley Mills, and at the Mills signage should directly lead to the towpath, mill entrance and other options. The existing cycle lane and paths on Legard Way and Wellington Road are inhospitable due to the proximity of several lanes of traffic, which at times is moving at 40mph. The paucity of opportunity to cross has discouraged pedestrian activity in this area. The cycle route takes cyclists off the busy road corridor, to Maybrook industrial Estate, and eventually link up with a crossing on the Canal. To reduce the impact that vehicular traffic is having on pedestrian and cycle movement environmental improvements should be made around the junction to create spacious and comfortable pedestrian areas, large refuge spaces, clear pedestrian and cycle signage, seating to rest at for the physically infirm, and good lighting for pedestrians. Wellington Road could be improved by creating a boulevard with wide pavements and pedestrian crossings, a tree lined road to improve its poor image, and encourage use by local people. New development should be encouraged to follow good Urban Design principles: to have outward facing active frontages to create a civilising effect on the road. Implementation will be achieved in a variety of ways but a clear priority is the establishment of The Riverside Way. For this reason an initial estimate of costs for the various sections of this is included below although a more detailed assessment is necessary. New tarmac surface with gritstone surface dressing, along existing track. Some re­grading. New link through switching station.New surface to route through Gotts Park.